ProphetLine was the world's first Windows specialty retail software, has won the Microsoft Retail Developer of the Year award four times and has extensive experience in the specialty retail business. ProphetLine is the quality product, with the best support and an unbeatable price that will help grow your business. 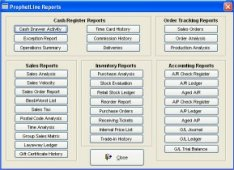 ProphetLine is the POS/Premium Merchandising Software with easy to understand department/class comparatives, vendor comparatives and built in open-to-buy planning. ProphetLine for Windows Reviews Recently Reviewed! Pros: The software is easy to use, and most importantly, does not crash! Nothing is worse than getting a call from an employee telling you that the POS software has crashed - this has never happened, not even once, with our Prophetline installation. Cons: I wish we could select an receipt printer for individual customers, as some still like the large full size receipt on 8.5x11 paper. Of course we can always print the larger receipt, but it would be nice to be able to set this up ahead of time. This is just a minor 'nit-pick' - really there is nothing I dislike about Prophetline. Overall: Our experience over 20 years running Prophetline has been excellent. It is rare to find a software vendor with this level of support. They answer the phone! Really, a live person will answer the phone without prompts, etc. if you have a question or need help in any way. These folks are head and shoulders above our other software vendors that require email support. Pros: The tech support is outstanding. The very best I have ever encountered. Available during normal business hours. US based and very helpful. The software i9s good but it is the tech support that really makes it great. Cons: Not really a con but there are a lot of capabilities I do not use. Overall: If every company was as pleasant to deal with as those guys running a business would be a lot less stressful. 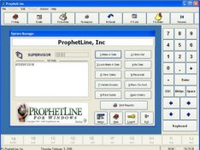 Pros: We have been using ProphetLine for more than 4 years now, the software is easy to use, and the customer service is hands down one of the best customer service departments I have ever had the privilege of dealing with. Always quick to answer the phone adn always treats each questions with professionalism and care. Pros: Easy to use and train employees. I like the editing and information we can get from the sytem. This is also the most bullet proof software we have! Cons: I'd like to have an easy way to pre-pay for orders placed where the software can still track the project until completion. Overall: I like the fact that I own the software and I don't have to keep renewing a licence. This software is so reliable that we don't need a lot of help or support. Pros: The email capabilities are very convenient from all departments. The ability to send emails to groups and from preset templates has helped save money in postage and paper. Most importantly the time saved in sending correspondence to customers or vendors has made our jobs easier. Cons: We are not able to email reports to customers from the system. We often have customers that want signed copies of their invoices but this system does not allow us to send a range of invoices per customer at one time. Pros: The service tracking module. Cons: The biggest negative for us is the inability to change customer ID numbers on the fly, and also combine customers (and keeping the dominant customer ID) also during the work day. This is achievable but all stations must be closed apart from the server. This is not efficient. Overall: The software does what it needs to. There has been virtually no down time over the past 10+ years we have been using Prophet Line. Pros: This is one of the easiest to use. You make a work order or invoice on same screen. Parts are very easy to put in and edit. Cons: The least I like about this and probably the only thing, is that when the mechanic uses a part on a machine that part stays showing we have it in stock even though we don't until they decide to come pay and pick up. Overall: The team they have is very helpful, and courteous . Cons: We had a lot of trouble with transfering inventory between locations. too slow part of the problem was ours but part of it was that we couldn't get it going. Pros: I like that when I call I speak to service representatives that can get into my system and show me how to use new features as well as fix problems I've caused. They can also customize certain forms according to my needs. Cons: Not ALL reports accurately show a/p or a/r balances. Some are for reference only. Pros: It is very easy to use and does everything we need it to do. Cons: It requires a lot of updates and sometimes runs extremely slow on all other computers except the back office computer. Pros: easy of use and it's reporting capability. Cons: It is client server and has a fat client. 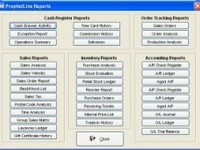 Overall: Prophetline gives our team the reporting capability we need along with it's support services always available. It will show the part number on the receipt and quantity and price can be updated at the same time. We are contacting Bree today and showing her how this is done. Pros: Customer Support and I can see inventory from 2 different retail locations. Cons: Nothing really, they take care of your issues. Overall: I have 2 retail stores and if you want a POS system that will answer the phone and help take care of the issue, pick ProphetLine. Pros: The software was easy to use and did not take hours and hours of training. Bob Brown, ProphetLine's president, is the nicest man I have ever had the pleasure of doing business with. The technical staff were always helpful and patient, even we called regarding the same issues over and over. Cons: The initial setup was a bit of a challenge because of all the different vendors, and we rarely had repeat orders due to sell-through, so a lot of setup time was required. I'm not sure it is unavoidable with any other software. Recommendations to other buyers: Make sure you like the people you will need to rely on for providing quick and friendly service since POS software is not something you want to have to switch once you've purchased it. Pros: The customer service available at the corporate office is top notch! Cons: I have nothing negative to report about this package. Pros: Order tracking works well up to a point. Cons: No easy to connect to third party email for customer notifications when orders are complete.